Not so long ago, simply having the highest-quality product, the savviest marketing, the greatest convenience, the best customer service, or the most bang for the buck was considered the key to business success. But times have changed. Now, CX has become the key growth driver and competitive differentiator. Put simply: effective customer experience management leads to higher customer satisfaction, reduced churn, increased revenue, and better overall business results. In this post, we’ll talk about different types of customer experience tools that can help your organization skillfully manage all the interactions between your business and the customer. But first, let’s examine the ways we can describe and define CX. Some organizations think of customer experience as the interactions between a business and a customer over the duration of their relationship. Others define CX as a kind of digital benchmark — the sum of customer interactions, say, on a website or a mobile app. Others, still, see their ability to respond to customer questions and cases — the company’s support function — as the focus of customer experience. So here’s a broad but all-inclusive definition: CX is all these and more. Customer experience is the cumulative impact of all interactions and experiences between your business and the customer, at every touchpoint across the entire customer journey, and viewed entirely from your customer’s perspective. Regardless of whether or not you already have a strategy for it, your business already provides a customer experience. The key lies on how your entire organization talks about it and manages it. You want to ensure that your customers are delighted by your brand, product, or service, from beginning to end, so that they develop loyalty and share their love for your company. These types of customer experience tools can provide valuable support as you map out your CX strategy. Social media listening, as a process and as a tool, helps you identify, monitor, and assess what is being said about your company or brand on Facebook, Twitter, Instagram, YouTube, LinkedIn, and other social media platforms. Customer feedback management refers to tools and mechanisms that enable organizations to collect and capture valuable feedback. Surveys are one of the most popular ways of doing so, but not the only way; on-site contact forms, phone numbers for sharing feedback, virtual suggestion boxes, on-site kiosk devices, and even SMS campaigns can also be useful in capturing feedback. Customer experience analytics is a great tool for organizations that are looking to connect the dots and visualize the entire customer journey. CX analytics tools usually feature technologies like Natural Language Processing (NLP), sentiment analysis, and data categorization — all of which serve to make customer experience issues and trends more transparent and understandable. 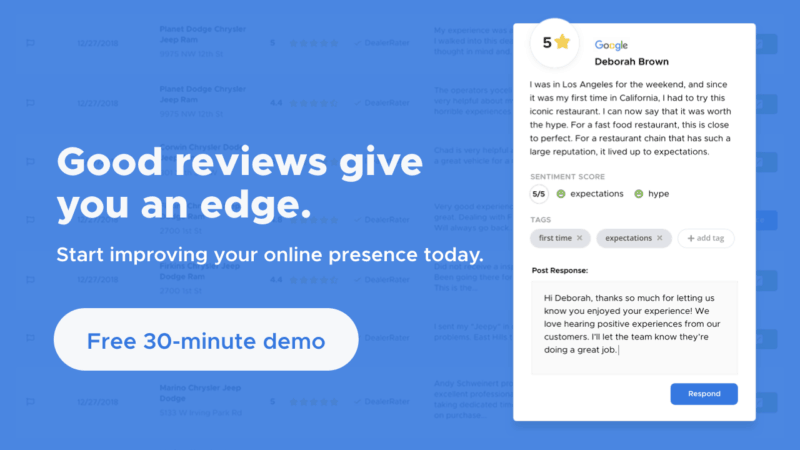 Online review management helps customer-centric companies manage and respond to online customer reviews, such as those you’ll find on sites like Yelp, TripAdvisor, even Google and Facebook. Self-service and helpdesks provide online resources that can save customers a lot of time and effort. This type of customer experience tool lets customers find answers to their own questions, monitor ticket status, and share new ideas and feedback. Personalization is another tool or process that can be utilized to improve customer experience. From adding personalized messages to your product packaging and segmenting customers by purchase behavior to creating customer-specific content and implementing responsive design on your website, personalization can help your business stand out and cut through the market noise. Live chat is one of the emerging customer experience tools that connect customers with human or artificial-intelligence-powered agents, often when they’re in need of help. A number of live chat tools also offer the ability to automate some of your marketing and sales processes; they could also be integrated with your customer relationship management (CRM) platform. Usability testing, in the context of the experience of your website visitors and potential customers, enables you to evaluate your website (and other digital properties). With usability testing as a customer experience tool, you can measure how “usable,” “intuitive,” or “easy to use” your website is for customers — from the moment they land on a page to the moment they check out or exit your site. The key to successfully managing your organization’s customer experience is to develop the ability to truly understand your customers: their thoughts and feelings, their wants and needs, their opinions and expectations. The customer experience tools described above should help you do just that — helping your business demonstrate its commitment to customers and show genuine customer love.